Crataegus oxyacantha rosea is figured in Paxton's Magazine of Botany. It possibly originated in the Perth, Scotland, nursery of Brown and Dickson. [MB p.198/1834]. Rosea superba is described as being ‘the most beautiful of all thorns, with deep crimson flowers and small red fruit’. [Gard. Chron. 1843]. Listed in all published catalogues [T.354/1843]. 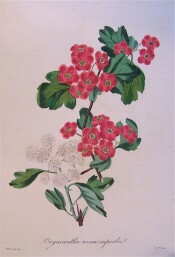 Pink Hawthorn, and other varieties, were probably obtained from Loddiges’ Nursery: ‘The plants of Crataegus will be ready by the winter but only C. roseus has flowered. C. puniceus we can only send on the authority of the name registered with it from the Messrs. Loddiges’.’ Letter to John Bailey of Adelaide, 24th December, 1844. [MP A2933-2, p.25]. Crataegus monogyna Jacq var. rosea | MB p.198/1834 as rosea superba | RBGS. A variety with double white flowers is also illustrated.